Next time your Angeleno friend complains about NYC’s fish taco scene, shut him up with a visit to this place. Tom Wilson and Eugene Ashe, formerly of Mas (farmhouse) opened this Cali-Mex specialty shop with the goal of recreating the taco shacks found along the PCH. It appears that, aside from the view, they have succeeded. 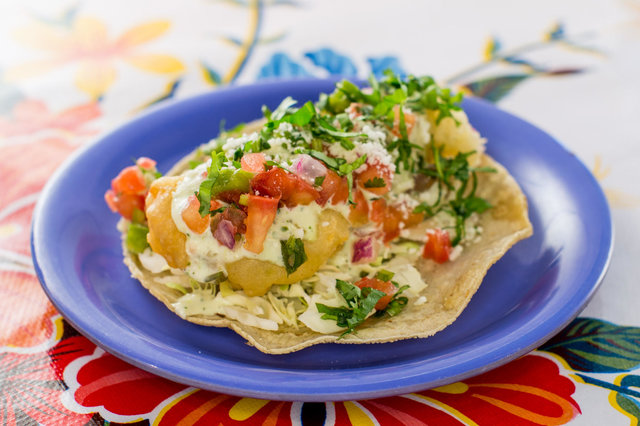 Their baja fish taco rivals those found in Malibu, with tempura-battered Mahi Mahi cradled in a soft corn tortilla with cabbage and avocado slaw, pico de gallo, and cotija cheese. Technically, suadero is a cut from the drop loin of a cow, a flap of striated muscle that runs close to the navel, similar to brisket. Butcher jargon aside, all you need to know is that it’s the must-order at this small Bushwick taqueria. The meat is extremely tender (with just the right amount of fat) and arrives inside a tiny, warm corn tortilla. You’ll need to order multiple to feel full, but with many tacos hovering around $2, it’s hardly an issue. Chef Jason DeBriere (formerly of Peels) draws inspiration from the Gulf of Mexico, and crafts Yucatán specialties with aplomb. His kitchen also turns out some serious tacos. The Mayan seared fish tikin xic-style is a necessary pick. Briny fish (not your average Mahi Mahi) is marinated in achiote, chiles, and spices, and served sans-salsa -- which it doesn’t need, anyway. The specialty at Alex Stupak’s East Village taqueria is -- you guessed it -- al pastor. Thin strips of marinated pork shoulder pivot around a rotisserie like tourists on a subway pole. That crisp yet tender meat gets sliced off and placed on a house-made tortilla with slivers of pineapple, before getting topped with red and green salsa, cilantro, and onion. To wash it down, there’s a broad list of beers and agave-based beverages including excellent micheladas and margaritas. If you’ve never had a taco before, welcome to planet Earth, and please enjoy our world’s finest fare at Taqueria. This is the platonic ideal taco spot for first taco timers and longtime fans. It offers all the classic fillings like ground beef, steak, pork and fish, and peddles a few entry-level adventure options like pork stomach and beef head. The best selection, however, is the barbacoa. Lean lamb drips in oil and disappears in three clean bites.